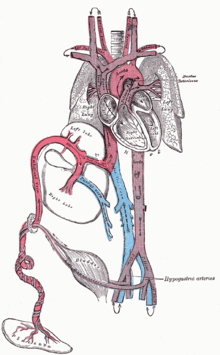 In animals that give live birth, the fetal circulation is the circulatory system of a fetus. The term usually encompasses the entire fetoplacental circulation, which includes the umbilical cord and the blood vessels within the placenta that carry fetal blood. The fetal (prenatal) circulation works differently from normal postnatal circulation, mainly because the lungs are not in use. Instead, the fetus obtains oxygen and nutrients from the mother through the placenta and the umbilical cord. The advent of breathing and the severance of the umbilical cord prompt various neuroendocrine changes that shortly transform fetal circulation into postnatal circulation. The fetal circulation of humans has been extensively studied by the health sciences. Much is known also of fetal circulation in other animals, especially livestock and model organisms such as mice, through the health sciences, veterinary science, and life sciences generally. Blood from the placenta is carried to the fetus by the umbilical vein. In humans, less than a third of this enters the fetal ductus venosus and is carried to the inferior vena cava, while the rest enters the liver proper from the inferior border of the liver. The branch of the umbilical vein that supplies the right lobe of the liver first joins with the portal vein. The blood then moves to the right atrium of the heart. In the fetus, there is an opening between the right and left atrium (the foramen ovale), and most of the blood flows through this hole directly into the left atrium from the right atrium, thus bypassing pulmonary circulation. The continuation of this blood flow is into the left ventricle, and from there it is pumped through the aorta into the body. Some of the blood moves from the aorta through the internal iliac arteries to the umbilical arteries, and re-enters the placenta, where carbon dioxide and other waste products from the fetus are taken up and enter the maternal circulation. The circulatory system of the mother is not directly connected to that of the fetus, so the placenta functions as the respiratory center for the fetus as well as a site of filtration for plasma nutrients and wastes. Water, glucose, amino acids, vitamins, and inorganic salts freely diffuse across the placenta along with oxygen. The uterine arteries carry blood to the placenta, and the blood permeates the sponge-like material there. Oxygen then diffuses from the placenta to the chorionic villus, an alveolus-like structure, where it is then carried to the umbilical vein. The core concept behind fetal circulation is that fetal hemoglobin (HbF) has a higher affinity for oxygen than does adult hemoglobin, which allows a diffusion of oxygen from the mother's circulatory system to the fetus. Fetal cardiac activity (also called fetal heartbeat and usually called embryonic cardiac activity before approximately 10 weeks of gestational age) is the rate of contractions during the cardiac cycles of an embryo or fetus. The heart is not fully developed when cardiac activity becomes visible. In cases of early pregnancy bleeding, the detection of cardiac activity is the main finding that distinguishes a viable pregnancy from a silent miscarriage. 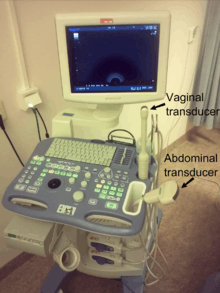 Device for obstetric ultrasonography including usage in 1st trimester. In the first trimester, heartbeat can be visualized and the heart rate quantified by obstetric ultrasonography. A study of 32 normal pregnancies came to the result a fetal heartbeat was visible at a mean human chorionic gonadotropin (hCG) level of 10,000 UI/l (range 8650-12,200). Obstetric ultrasonography can also use doppler technique on key vessels such as the umbilical artery can detect abnormal flow. 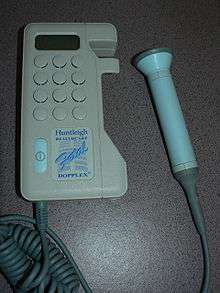 In later stages of pregnancy, a simple Doppler fetal monitor can quantify the fetal heart rate. During childbirth, the parameter is part of cardiotocography, which is where the fetal heartbeat and uterine contractions are continuously recorded. Starting at week 5 the embryonic heart rate accelerates by 3.3 bpm per day for the next month. Before this, the embryo possesses a tubular heart. At week 9 the embryonic heart tends to beat within a range of 155 to 195 bpm. By the end of week 9, the embryonic heart has developed septa and valves, and has all four chambers. At this point, the fetal heart rate begins to decrease, and generally falls within the range of 120 to 160 bpm by week 12. Obstetric ultrasonography of an embryo of 8 weeks with visible heartbeat. 1 2 3 Whitaker, Kent (2001). 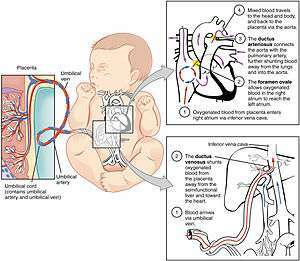 "Fetal Circulation". Comprehensive Perinatal and Pediatric Respiratory Care. Delmar Thomson Learning. pp. 18–20. ISBN 978-0-7668-1373-1. ↑ Kiserud, T.; Rasmussen, S.; Skulstad, S. (2000). "Blood flow and the degree of shunting through the ductus venosus in the human fetus". American Journal of Obstetrics and Gynecology. 182 (1 Pt 1): 147–153. doi:10.1016/S0002-9378(00)70504-7. PMID 10649170. ↑ Le, Tao; Bhushan, Vikas; Vasan, Neil (2010). First Aid for the USMLE Step 1: 2010 20th Anniversary Edition. USA: McGraw-Hill. p. 123. ISBN 978-0-07-163340-6. ↑ Edoh D, Antwi-Bosaiko C, Amuzu D (March 2006). "Fetal hemoglobin during infancy and in sickle cell adults". African Health Sciences. 6 (1): 51–54. doi:10.5555/afhs.2006.6.1.51. PMC 1831961 . PMID 16615829. ↑ Johnson P, Maxwell DJ, Tynan MJ, Allan LD (2000). "Intracardiac pressures in the human fetus". Heart. 84 (1): 59–63. doi:10.1136/heart.84.1.59. ISSN 0007-0769. 1 2 Struijk, P. C.; Mathews, V. J.; Loupas, T.; Stewart, P. A.; Clark, E. B.; Steegers, E. A. P.; Wladimiroff, J. W. (2008). "Blood pressure estimation in the human fetal descending aorta". Ultrasound in Obstetrics and Gynecology. 32 (5): 673–81. doi:10.1002/uog.6137. PMID 18816497. ↑ "Fetal and maternal blood circulation systems". Swiss Virtual Campus. Retrieved June 29, 2011. 1 2 3 4 5 Kiserud, Torvid; Acharya, Ganesh (2004). "The fetal circulation". Prenatal Diagnosis. 24 (13): 1049–59. doi:10.1002/pd.1062. PMID 15614842. ↑ Giacomello F, Magliocchetti P, Loyola G, Giovarruscio M (1993). "[Serum beta hCG levels and transvaginal echography in the early phases of pregnancy]". Minerva Ginecol (in Italian). 45 (7-8): 333–7. PMID 8414139. ↑ FetalSure. Fetal Heart and Heartbeat Facts. Available at http://www.fetalsure.com/fetal-heart.html. Retrieved 9 August 2010.